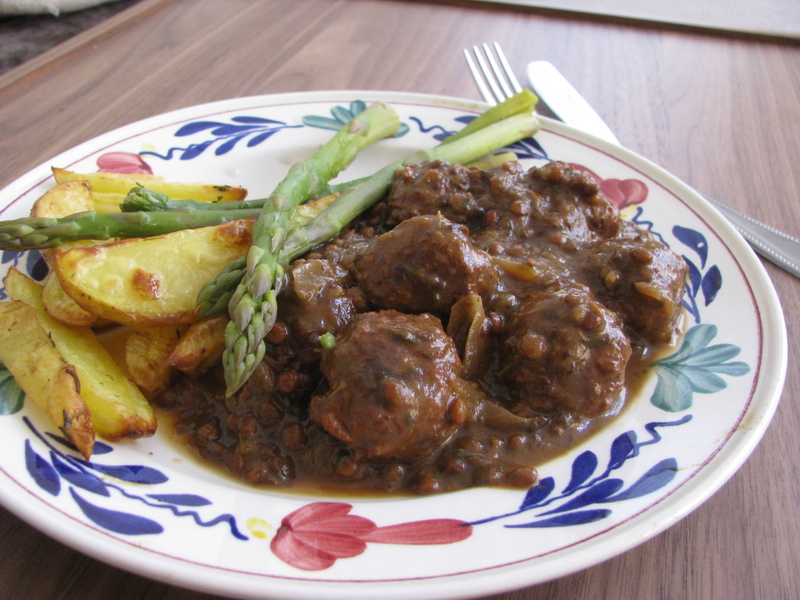 Vegan carbonade flamande | Fork off, heart disease! Whaaaat? A VEGAN carbonade flamande? That famous Belgian MEAT stew? It all started with a girlie trip to Antwerp. My friend Gloriana ordered her favourite carbonade over lunch – the saucy, meaty dish is usually served with frites. The steaming hot bowl certainly looked like it would take the edge off a chilly day. So I started to wonder: what if I could veganise it? And when I found out that it had beer in it, well, that sealed the deal for me. I was a determined woman! So I set my devious plan in motion. I had previously experienced some delicious success with making a rich and hearty stew. What if I could take a carbonade recipe and tweak my original stew recipe a bit? So I took this recipe I found on a Dutch site and set about modifying it. And what was the result? Delicious!! Husband was bobbing his head up and down when he was eating it (always a good sign with the menfolk bob their heads in approval whilst making thumbs-up hand gestures). I still have no idea whether the taste even remotely resembles real carbonade, as both of us never had it before. However, I can say that it is a satisfying and filling stew that will leave you all warm and fuzzy on the inside, just in time for this cooler, autumnal weather. Take a large-ish pot and spray a bit of oil in the bottom. Toss in the onions, garlic and mushrooms with a bit of salt (or cook the onions in a dry pot with a bit of extra veg broth to de-glaze the pot) and cook over medium-low heat. Cook down the veg until soft and caramelised and the mushroom have lost their moisture. Use extra veg broth to de-glaze the pot if the veg are sticking to the bottom. In a separate frying pan, fry your veggie balls or seitan until brown. When the veg are tender and have some colour, toss in the beer, mushroom bouillon cube, porcini powder, thyme, bay leaf and cloves. Let the bouillon cube dissolve, then add the prune slurry, mustard, red wine vinegar and lentils. Toss in the veggie balls, cover and let simmer a few minutes for the flavours to mingle. Adjust the seasoning with salt, mushroom broth, mustard and/or red wine vinegar. Serve will freshly cracked pepper with a side of oven frites and steamed veggies. What is your favourite, back-to-autumn dish? Great! I’ll have to try this one on some of my vegan friends. Thanks so much for the comment! Let me know how you get on. You might have to tweak with the flavours to suit your taste but it is such a nice, rich stew.